The definition of a “holiday” is: a special day of celebration. So we just celebrated one a few days ago. I was blessed to be taken out to brunch after church by my family. I also found myself thinking about my own dad who passed away seven years ago. I recall in my early years, me and mom going into the corner drug store to get a Father’s Day card for dad. Naturally, I was not fully cognizant of the whole process and mom pretty much did everything right up to the moment that I handed my father the card. As I got older, I read the messages inside and had some input into what particular prose matched what I felt for my dad. Suddenly, the process of making a final choice got longer. 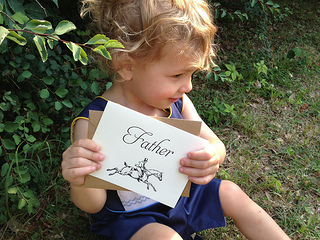 How can I match these heartfelt words on a card to my current experience, or lack thereof, as a son? I have the benefit today, being “mature” as I am, to see the redemption that can take place in a father-son relationship. Healing the father wound is a topic I teach on today, partly due to the many hours I’ve spent in pursuing my own healing. That crucial season of childhood, ages birth to seven, were a barren wasteland of fathering in my world. All of the needed affirmations, foundational to later years, were pretty much left blank. As a teenager I was threatened to be thrown out of the house because of my hairstyle. Yes, believe it or not, I had a Jimi Hendrix-ish style of afro! It did not mix well with my ex-Marine, conservative dad. We were typically distant, cultured in the 60’s as I was, believing that authority figures could not be trusted. Fast forward to my becoming born again, meeting my beautiful bride in Bible school, and producing grandchildren – dad and I had a new common ground on which to fellowship. We were both heads of a household and we were both dads. I saw him through a new lens; it changed both of us. The pain in my own heart, coupled with my desire to be a different kind of dad for my own children, drove me to be an avid reader of books – I read everything I could find on the healing of memories. I issued an open invite to Holy Spirit, to do whatever was required for my wholeness. Brokenness was not going to be in the mix of what flowed in my lineage. As my mom aged, she was stricken with Alzheimer’s. To my surprise, dad took care of her almost exclusively at our family home, where she died in her own bed. We were both on the same team, sharing a common purpose in helping mom as best we could. These became some of our best years as friends. In his later years dad became sick and spent his final two years in a nursing home. I would visit him as often as I could, while also being in charge of getting all of his affairs in order. I relived a ton of memories while cleaning out the family home, preparing it to be sold. Talk about grieving! Many tears found a release during this season. I wept at his grave as two Marines folded up and handed me the American flag that was draped over his coffin. A year after he died, we relocated to our present home in Kansas City, Missouri. For the first couple of years I had many a time of being prompted, “I should give dad a call”, only to remind myself of the reality of his absence. Some of you will be able to relate to parts of my story, and without a doubt, each of us has a unique experience. I offer you a recently recorded series of (4) video podcasts, to view on this topic. Parts One & Two are linked below. Parts Three & Four will be up on my You Tube channel later this month. Mike, what a great word you shared. I remember your Dad well…he really was a very kind man, as was mine. However, they were stern and seemed so “large” when we were kids. The interesting thing I remember was how we were taught to honor, not only our parents, even though rebellion seemed so natural….but, our friends parents as well. As I watched your videos I could relate to much you said. Both our Dads were also quite Italian, and that bore another dimension to the absence of the demonstration of Love. However,I can look back fondly on the love that was demonstrated by the tight “borders” our parents created(it didn’t feel like love then….) to keep us safe from the challenges of life. Thanks for giving insight to the Abba Fathers love, that covers all the wounds….and reminds, we get to have a hope for the things to come. Nancy: thanks so much for your comments. Lots of great memories indeed, and I agree, they loved us in the best way they knew how.